Welcome to our Ohana. Ohana in Hawaiian means family. When you stay with us, you’re family. The only thing you need to do is book your ticket, rent the car, and get here. With newly installed A/C you will stay cool all year round. Puako is a quaint, secluded community. As you drive past the 1852 Hokuloa Church, you will immediately feel like you have stepped back to a more relaxed time in old Hawaii. Quiet and away from the crush of tourists, there are only 160 homes along the two miles of Puako Beach Drive. Our unit is one of the best situated of the 38 condos in Puako, with a ground floor location and a large private side lanai (with outdoor dining and a BBQ). We’re also conveniently located next door to the historic and friendly family-owned Puako General Store, where you can buy food, cold drinks, prepared meals, rent DVDs, and more. Our unit has 2 beautiful lanais (front and side) and lots of louvered windows that encourage a cross breeze in the evenings, naturally cooling the space (and ceiling fans in each room help, too). The kitchen and bathrooms were fully remodeled in June 2014. They are fully stocked with everything you need to feel at home and dive into the rest and relaxation of the spirit of aloha. A reserved parking spot is conveniently located right in front of the unit. A/C is available. The main attraction: the BEACH – right across the street. It’s perfect for snorkeling and is home to many honu (sea turtles). Wake up for the sunrise over Mauna Kea and see the turtles sunning themselves on the rocks. Just a 200 yard walk from your front door. And, in the same spot, is the best sunset on the island. It’s magical. Puako reef is also recognized as one of the best scuba areas in all of Hawaii. Stand-Up Paddleboards and kayaks are available for rent nearby. Close by is Beach 69, one of our favorites. Great for swimming, snorkeling, and surfing if the weather is right. Just past Beach 69 is Hapuna Beach, named Best Beach in America in 1993. And you can get to it from Puako without having to get on the highway! Further up the road is the Mauna Kea Resort. Pull up to the security gate and ask for a beach pass. Then set up your spot and head to the beach bar for one of the island’s best Mai Tai’s. Or play golf or tennis at Mauna Kea, the Hapuna Beach Prince Hotel, or the Mauna Lani Resort. All located just minutes from the condo. Ocean adventures (whale watching, swim with wild dolphins, and manta ray snorkeling) are available from the Puako Boat Ramp, five minutes (or less) from your door. Best part of the day is coming back from the beach or ocean and jumping in the pool! It’s refreshing and always sparkling. Kids love the wading pool, perfect for the little ones still learning to swim. And don’t forget to grab our beach chairs and check out the beautiful sunsets from the beach just across the street! The grounds are impeccable with lush gardens, tropical flowers and fruit trees. Enjoy cooking in our fully equipped kitchen, throw some fresh fish or local meat on the grill, or dine at some of the world-class restaurants nearby. You will be right at home at this lovely location! White ceramic tile floors in kitchen, hall, entry hall, and bathrooms. New carpet in the bedrooms. LCD TV with cable programming, Bluray DVD with streaming (for Netflix, etc. ), Wifi, Electric BBQ Grill, Washer/Dryer, Dishwasher, Microwave. One of the most affordable places to stay in Puako! Sleeps 6 - King, Queen, 2 Twins. Island Beach Rentals LLC RB-21967 manages this property on behalf of the owners. We have a team to service our guests and properties. We are here to assist you with the perfect island vacation and any requests during your stay. Marla is our Reservation Agent and Kirsten is the manager of Guest Services. Jay and Arlene are Owners and Carla Ellis is the Principal Broker. Our staff oversees all of the day to day operations: repairs, communications, arrivals and guest requests. We are on call every day for any emergency or guest need. We have numerous repeat guests. We have been managing Vacation Rentals in Paradise for over 22 years and we have lived in the Islands for all of our lives. We are here to assist you with your dream vacation! Professional, but personal and friendly “aloha” style. We have been around a long time and we have reputation that we are proud of. We look forward to speaking with you soon and helping you with your dream vacation! Aloha! Puako (Pu-ah-ko) is a small, quaint oceanfront community on the Kohala Coast of the Big Island located about 30 miles north of Kailua-Kona and 22 miles north of the Kona airport. The island's largest white sand beach, Hapuna, is right next door. Puako is conveniently located for visiting all the resort hotels and restaurants on the Kohala Coast. The Mauna Kea, the Fairmont Orchid, the Mauna Lani and Hilton Hotels are just minutes away with their beaches, first class restaurants, shops and world class golf courses. Kohala Divers is nearby at Kawaihae Center, and offers various ocean activities including scuba diving and sunset/afternoon sails. Kawaihae Center and Harbor are just 10 minutes by car, with several great restaurants and shops. You are close to almost any activity you may choose, with the exception of the volcano which is a 3 hour drive from Kohala. Several fabulous beaches are minutes away. Hapuna Beach (voted best beach in Hawaii by Conde Nast Magazine) and Waialea Bay (Beach 69) both are wonderful for swimming, snorkeling and boogie boarding. The neighborhood is called Puako, and it is conveniently located for touring all parts of the island. All homes in this neighborhood are on small acreage, so it is a very low density area. Driving time to the Kona airport is approx. 40 minutes, Kailua Kona 50 minutes, Waimea 20 minutes, Hilo 1½ hours, Captain Cook, coffee country, 1¼ hours, Hawi and Polulu Valley 20-30 minutes. The sun shines 355 days per year and the average temperature highs are in the 80's with low's in the 60's. The ocean's edge is about 150 feet from your doorstep with crystal blue water that is 72-76 degrees year round. Puako offers ideal fishing, snorkeling, diving, surfing and kayaking. Walking and biking is a favorite, too! Sea turtles, dolphins and whales are some of the sea life you may see. Puako offers beach style living and a real sense of getting away from it all. Puako is rich in Hawaiian history. Walk south along the ocean trail to see the petroglyphs. There are approximately 3,000 petroglyphs scattered throughout the Puako Archaeological Fields. These pictures are etched into the lava rock that dominates the Kohala and Kona Coasts. Access to the Puako Petroglyph Park is through the adjacent Mauna Lani Resort. The waters around Puako are extremely clear due to the fresh water run off and strong coastal currents. Divers and snorkelers can enjoy waters abundant in sea life along the shallow reef at Puako. The Puako Marine Preserve is a protected environment for endangered sea life. Green sea turtles are a protected species and should not be bothered, only enjoyed and admired. Watch the humpback whales play along the coast. Beyond Puako's reef shelf the whales play and breach during their migration to Hawaii from Alaska. It is quite a sight! Just remodeled! Easy entry for those physically challenged. Ocean Access across the street offers excellent snorkelling and tide pools. Whale watching in the winter! The condo easily accommodated 3 couples. The location in Puako was perfect for access to beaches. The kitchen had everything we needed for cooking. The two decks provided a sun or shade place to sit or eat. Beach towels and beach chairs were available for our use. There is an electric barbecue that is easy to use. The decor was very nice.Right next door is a store that has everything you need. Mahalo for staying with us and your kind comments! Our team is so pleased that you enjoyed the place and had a great time. We loved having you as our guest! Quiet, great location, and a kitchen better stocked that most home kitchens. The off shore breezes flow right through the house providing a refreshing atmosphere. Easy access to the ocean for snorkeling. 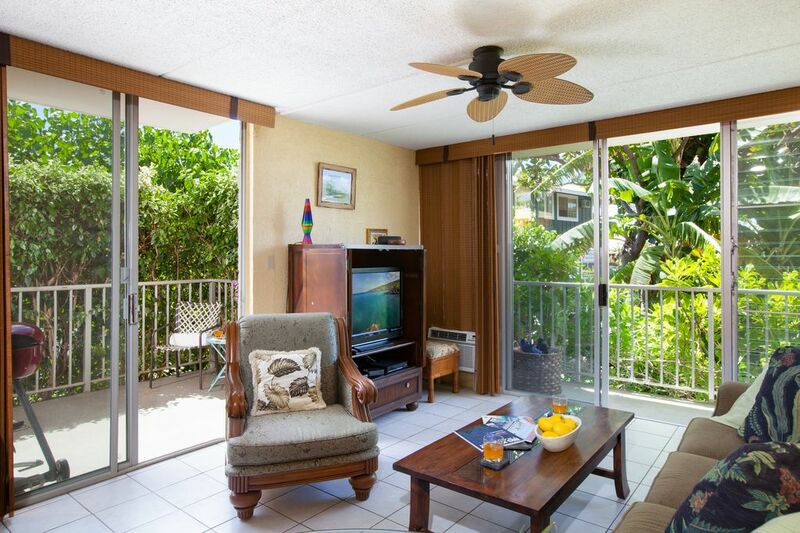 This condo is a great deal, and the Puako area is lovely. We really enjoyed our stay! Great location and super clean property. Will come back. We had a fabulous stay at Puako Condo #101. It was well-maintained & clean with no tropical pest issues. Beds were super comfy. Bathrooms & kitchen were stocked with anything you might need. Entire unit was attractively furnished. The location is perfect, next to a general store & a short walk to two beaches. We plan to return next year-absolutely loved it!! Nice location across from Puako beach, with good access to Saddle Road, Hapuna and Mauna Kea Beaches. The condo had some issues -- there was no land-line (an issue for Canadians who need an expensive roaming plan!) , no BBQ (although an electric grill was provided on request), smoke detector battery died during our first night (ie no one had checked it) and there were some issues with the cleaning. There was no parasol on the lanai, so it was a very hot place to eat lunch. According to the property manager, the ownership had recently changed, so there were things to iron out. Most issues were addressed by the property managers, which was appreciated. The lack of A/C was not an issue, as there was a beautiful breeze at night. The kitchen is very well equipped, and we loved the fruit trees just outside our door!! We enjoyed the oranges, bananas, lemons and limes. If you are driving a large vehicle such as a mini-van, the parking spot is a bit challenging. We did enjoy our stay, and appreciated the follow-up message from the property management regarding our issues. Aloha and thank you for staying with us! Most of our Vacation Rentals do not have a landline phones. This is because people prefer to use their cell phone and it is the first time a Canadian had mentioned that to us that it was a problem. We had not noticed the umbrella disappeared perhaps the wind had blown it away… But all you have to do is call us and we are quick to respond and replace. We would've been happy to put an umbrella on the lanai! We do our best on all cleaning and repair issues and are quick to respond.... thank you for acknowledging that. The only mention of new ownership was to let you know that new items we're being purchased such as a new grill which arrived on November 14… We were lucky to be able to borrow one for your stay. Since it was in the process of being shipped. Mahalo for staying with us! We appreciate all the helpful feed back especially going to all the details on how your vacation stay would be perfect. As we are striving for exceptional stays and excellent values we will deliver an even better stay for everyone given your experienced feedback!